A wide range of fertilisers is available for use in agriculture for increasing the crop production and productivity from the farm lands. The different range of fertilisers i.e. bulky or organic manures is to be applied in such a proper and efficient manner so that most of the micronutrients & macronutrients should become available to the crop plants or soil in which they are deficient. The knowledge of the methods of fertilisers also facilitates the fertilisers to be spread among the whole cropped area & to all crop plants which will automatically increase the crop yields. The time and proper method are not only the matter of consideration of fertiliser application but side by side the different nature of soils is also considered before the fertiliser application. The soils of different areas have different requirements of N, P, K for the fulfilling the needs of different crops. It will increase the fertiliser uptake efficiency of crop plants. It will reduce the harmful residual effects of herbicides on the next crops due to their full use. It will also decrease the waste of economic resources as by using proper method of fertiliser application there is less wastage of money spend on fertilisers & a better or good yield is obtained. It will also facilitate the timely application of fertilisers and the timely availability of fertilisers to crop plants. Basal application: It is the application of fertilisers at the planting time with the help of ferti-seed drills or before the emergence of plants so as to the uniform distribution of fertilisers to all the plants to be grown. A full dose of phosphoric & potassic fertilisers along with a half dose of nitrogenous fertilisers is applied as a basal application in almost all the crops. Top dressing: It is the spreading or application of fertilisers in the standing crop or after the emergence of the crop in the fields. It is mainly done for the application of nitrogenous fertilisers to the leaves of plants for good growth & development. In phosphoric & potassic fertilisers it will do only in pasture lands. It should not be done when the leaves of plants are wet as it will burn or scorch the plant leaves. 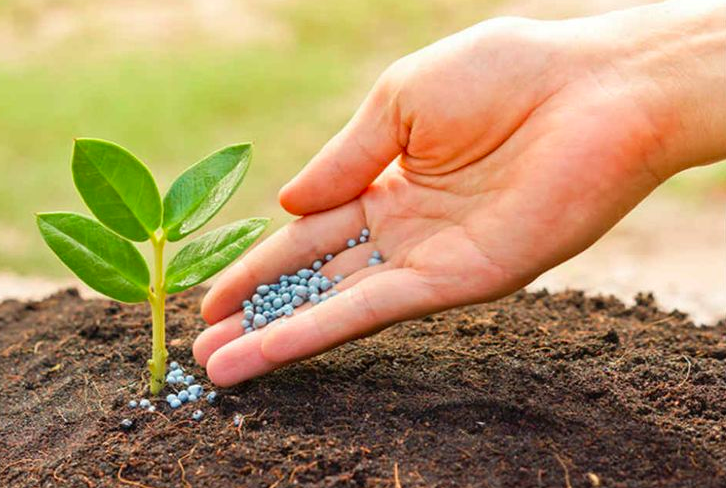 The fertilisers which are mainly top dressed are urea, sodium nitrate, ammonium nitrate etc. Plough sole placement: Here the fertilisers are placed in ploughed soil opened by the plough in between the furrows. Each band is covered when the next furrow is turned. This method is followed in the dry soils or in the problematic soils of limited water supply. Deep placement: It is the deep placement of especially nitrogenous fertilisers such as ammonia fertilisers in reduction zone of deep root layers for the availability of fertilisers to crop plants. It also prevents the loss of nutrients by runoff or by denitrification. Localised placement: It is the method of placing the fertilisers close to the seed or plants so as to increase their availability to the young plants. It is used when the very small quantity of fertilisers is to be applied to the plants. Hill placement: It is mostly practised in the orchards. Here the fertilisers are placed in close bands on both sides towards the plants. Row placement: It is followed in cereals, maize, tobacco, potato, sugarcane & in many vegetable crops. Here the fertilisers are placed in continuous bands on the both sides of the rows to plants or seeds. Side dressing: It refers to the spreading of fertilisers in between the rows & around the plants. It is practised in many field & horticultural crops. Pellet application: It is done mostly in case of nitrogenous fertilisers to increase the efficiency of these fertilisers in crops like paddy etc. The small pellets of convenient size are made and deposited at a depth of 2.5 to 5 cm in the soft mud in between the paddy rows. Here the fertilisers are mixed in the soil in the ratio of 1: 10. This method of fertiliser application will decrease the losses of nitrogen by leaching or by run-off water. Starter solution: It is prepared by mixing the N: P: K fertilisers in the ratio of 1:2:1 or 1:1:2. This is applied at the growth stage of seedlings to vegetables & legumes or at the time of transplanting of vegetables. Foliar application: It is the method of spraying of leaves with a solution of a low concentration of fertilisers in liquid form. It supplies only one plant nutrient. Direct application to the soil: In this method the liquid fertilisers like anhydrous ammonia etc. are injected directly into the soil with special equipment. The liquid manures like urine, cowshed washing, sewage water etc. are added directly into fields as manures. Fertigation or application through irrigation water: Both the straight & mixed fertilisers are added into the fields with the irrigation water is known as Fertigation. Nitrogenous fertilisers are mainly applied through this method.